What you should also know is that we both are avid travellers, often joking that we live and work in order to travel. We have even gotten into the bad habit of motivating ourselves in terms of trip planning (there is just so much to see in this magnificent world!) and try to go on large trips every other year with short trips on the years we don't. Asia, Europe and North America, we've covered it or a part of it. 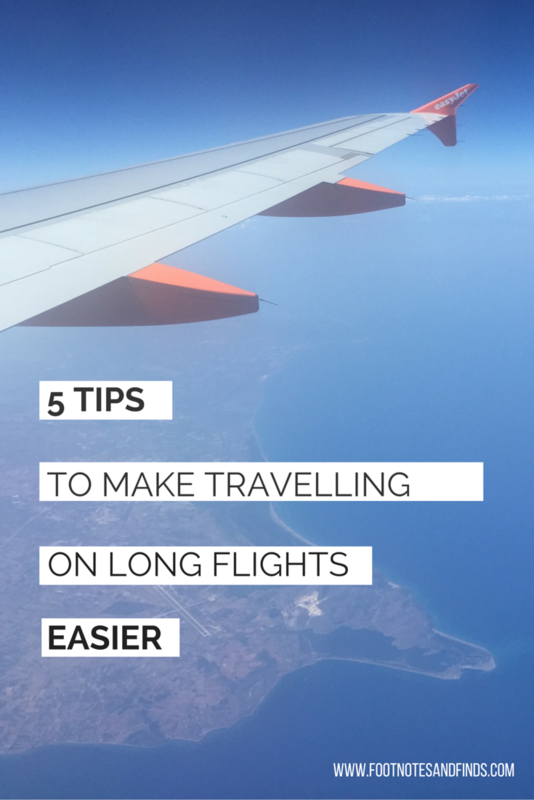 Meaning, we have grown accustomed to long flights and so, these are our 5 most important lessons we have learned that we would love to share with you. I usually get to the airport early enough that after I do baggage drop (having checked in online the night before and printed my boarding passes) and clear security I have enough time to eat a meal before I get on the plane. This is important because eating on the plane during a long flight is not enjoyable (lack of appetite, upset digestion, distasteful food). I also grab snacks I can eat on the plane throughout the flight because my stomach and plane food do not go together. And even if you do eat the meals on the plane...it just isn't enough. Keeping your stomach the right level of full on a plane is key to not having your stomach be upset both on and off the plane! A fuller stomach also helps you fall asleep. I can not stress how important this is. Many people get this one thing wrong. Make sure you drink water before your flight, during your flight and after your flight. Remaining hydrated is so important for overall health in life so nothing changes when you fly. This point is especially important when you realize that the cabin pressure dries out mucous membranes and causes headaches, congestions, and muscle aches. As an extra tip I would suggest to steer away from soft drinks and alcohol--they just dehydrate you and cause stomach aches! Sadly many airlines have also stopped supplying blankets and pillows so advise packing them for yourself. I usually pack a blanket scarf in my carryon. If you are someone that gets cold easily then you should also wear socks. I know many doctors advise not removing your shoes on flight as your extremities tend to swell up but I love taking off my shoes and curling up on the airplane seat while watching an in-flight movie so wearing socks help to fight the cold. In fact, pack a touque (beanie) it can act as a light blocker as well as keeping your head warm. This is something you hear all the time, but its good advice, especially if you have injuries. I love to get up and stretch, walk around get out of the airplane seat mentally and physically. Well, I mean, with all the water I am drinking the legs get a stretch by walking to and from the washroom anyways! But moving around during the flight helps to keep the blood circulating, the swelling down and aches away! Gum: helps your ears during take offs and landing, also a good thing to have if you feel nauseous (but not if you feel gas-y or that your stomach is full of air) and if you want to freshen your breath! Pen: Pens are so important from filling out tags to your landing cards--you don't know when you'll need a pen. Earphones: some flights have started charging for in-flight earphones..so dont forget to pack your own! a book: if you get tired from watching movies or you're unable to sleep read a book for a bit! an ipod or something to listen to your music on (I guess nowadays the kids just use their phones eh? ): This may seem antisocial, but when I travel by myself I listen to music continuously except for when I watch movies. Basically, whether I am walking around the airport or seated in my seat I am plugged in and it makes flying easier for me. I hope these tips help! I know flying can be stressful and we all have our own tips and tricks to survive long flights but I love sharing and hearing ideas to improve my flight game! So what are your tips? these are such great tips! i walked a lot on our last flight, mainly because of our little one. and it helped a lot! Amazing tips!! Thanks so much for posting! These are wonderful tips! I'm never really excited about long flights, so these will be quite helpful! I definitely agree that drinking water often is so important...planes are always so terribly dry! Love these tips! Such good reminders before summer travel begins as well. Definitely agree about drinking so much water! That's the only way to feel relatively normal after a long flight. P.S. let's follow each other! These are all great tips! The longest flight I've been on is like 6 hours, but I want to plan a Europe trip soon, so I'll have to keep these in mind! Great tips! I'm doing a long flight this coming weekend so will make sure all this is noted. I'll also add some ear plugs for when I want to go to sleep but not be disturbed by the other passengers and cabin crew. Great post. That's so interesting to hear that your Drs recommend not taking your shoes off because of swelling, our Drs in the uk recommend you DO!! Any flight over 3 hours, my feet and legs swell. I know instantly, when it becomes a struggle to put my damn shoes back on my feet when we land lol!! Even with walking around it does always help. I find doing regular calf exercises while seated helps reduce the swelling. Now I've started doing these the swelling doesn't last as long (used to last 3/4 days into my holiday)! !